We feel you shouldn't need to skimp on build quality to buy a reasonably priced Oki B4350n printer cartridge. Because of our no quibble money back guarantee on toner cartridges you never be forced to take any chances. Here at Cartridge Save we're focussed to help you save money giving up on build quality and functionality. Get your order in now on Cartridge Save and start saving! The network-ready Oki B4350n is great for small offices. This unit comes with built-in Ethernet and it has a high monthly duty cycle of 40,000 pages. Print resolution can go as fast as 1200 x 600 dpi. Aside from the Ethernet, the Oki B4350n printer also offers parallel and USB connectivity options. This monochrome model delivers great output quality from text documents to graphics and images and even photos. For a workgroup printer, not only is the Oki B4350n slow, it also has poor paper handling capacity. The Oki B4350n is a relatively small office printer with dimensions of 35.5 x 39.6 x 21.6 cm and it only weighs 10 kg. The compact Oki B4350n mono laser printer has a small control panel with a monochrome LCD display. Paper trays can handle a maximum of 750 sheets. The Oki B4350n's print speed is 23 ppm, with the first page coming out in 6 seconds. This printer is easy to use and install, plus it has built-in Ethernet. Users can expect great quality output from the Oki B4350n laser printer. The B-4350n mono printer runs on a 16 MB RAM, which can be expanded to 272 MB. To cut the cost of toner, this model can use a compatible high capacity black Oki B4350n toner as its best value cartridge. 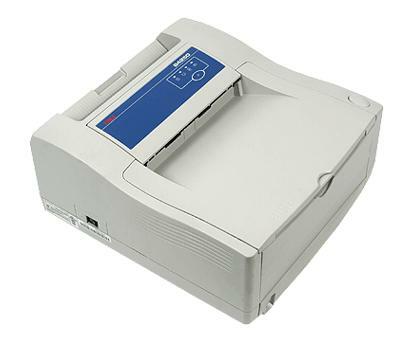 The Oki B4350n could be better if it had higher paper handling capacity. Even with an optional tray, it can only handle 750 sheets. The Oki B4350n network laser printer has a decent print speed in general, but compared to other laser printers, the Oki B4350n is very slow.